The cobblestone Colonial at 440 Middlesex Road in Darien, on the market for $2,965,000, is the original main house of the Althea Farm and was built in 1907. 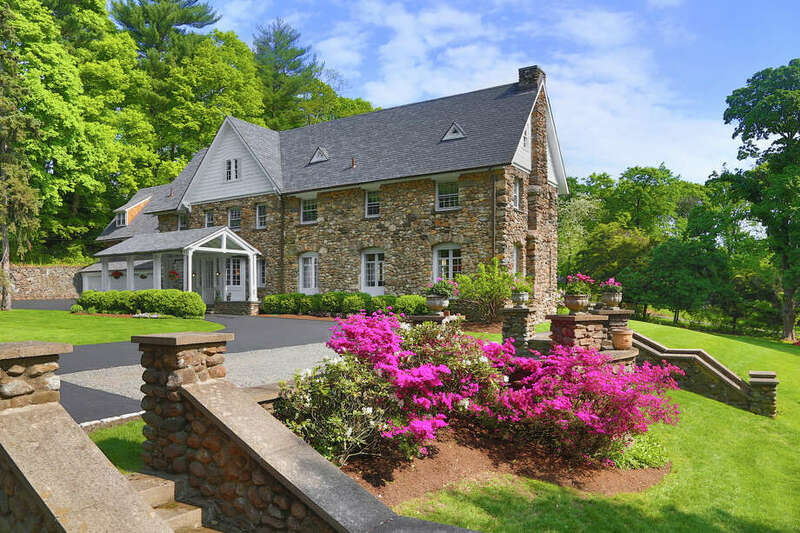 A steep little driveway off 440 Middlesex Road in Darien leads to a colossal historic stone mansion -- the original main house of the Althea Farm built in 1907. The driveway turns right, then left, before passing under a porte-cochere at the front and ending in a welcoming shady patch of smooth blacktop opposite an attached three-bay garage. And here stands a nearly century-old three-story construction with two levels of round stone topped by antiquated white wood and sections of a high, steep roof covering a third floor. It looks much more like an inn or a club given the enormity of the front room at the entrance. To the left is a set of stairs and to the right is a gigantic living room lined with three sets of French doors on each side of its 38 feet and a stone fireplace. The floors are wood and the ceiling is a pattern of parallel beams. To the left outside is one patio, which is cozily in the right angle of the living room and main building wing. It feels private, but is also situated to gain maximum southern exposure. Straight ahead from the front door is a formal dining room with a chandelier, wainscoting and a thick fabric wall cover instead of paper. There are several sets of French doors on either side, along with a fireplace. Still further back there is a sun room constructed with stone, with arches built around the windows, and a marble tile floor. Directly outside this room is a slate patio leading up to a pool -- just part of a private, two-acre lot that's mostly green grass. Left of the dining room a good-sized kitchen combines practical accoutrements with a section of living space, featuring a stone fireplace. There are many built-in cabinets throughout the kitchen, including some glass ones, along with a wood-topped island. There's another set of stairs at the back of the adjacent mudroom that leads to a back bedroom, or office. From there, a third flight of stairs reveals a private room currently used for exercise equipment, but perhaps better suited to a library, with its wealth of built-in bookshelves. There is also an L-shaped playroom on the third floor with tons of space -- so much that it easily can be divided into two large separate spaces. There is, incidentally, a small walk-through attic at the east side of the building, but it's substantially dwarfed by the gigantic clean and cool main attic on the west side. One of the most interesting spaces is a two-bedroom suite on the second floor, which is down a private hall off the main one. A special open closet on the right of the hall has vintage ceiling-high built-in cabinets and an array of drawers. The master bedroom at the west end of the house is at the end of a long main hall, featuring his-and-hers walk-in closets with pocket doors. Again, there is an attractive dark green wall fabric above the wainscoting. The bedroom itself is sprawling with a small fireplace and three walls of windows. For more information or to make an appointment to see the house, contact Becky Munro at Halstead Property at 203-858-6182 or bmunro@halstead.com.